Batman: Arkham Asylum is our Pirate story! 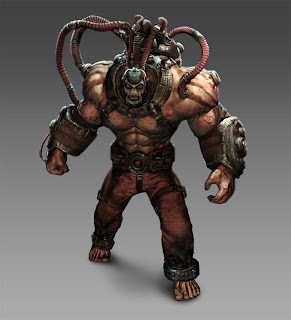 Today we bring you a vignette of a recently revealed foe for Batman; Bane. Now, fans of the comic will no doubt know the name, but for those of you who don't, here's a brief rundown. Imprisoned from birth to serve his dead father’s sentence, Bane was raised inside the horrific environs of a Santa Prisca prison. Finding solace in smuggled book and meditation, he developed incredible powers of concentration. When he was subjected to military experiments with the experimental steroid Venom, his iron-forged will helped him survive when other test subjects had died and he manage to escape. Determined to prove his worth, he sought out Batman and broke the Dark Knight’s spine. But Batman recovered and managed to best Bane, cutting off the precious Venom supply that transforms Bane into a superhuman.